The quintessential Malaysian durian is the common love of most Malaysians, regardless of race and creed. In the old days; they said when durian falls, sarong drops. Sarong is the traditional Malay skirt which would be pawn for money to buy durian! Such is the craze over this exotic tropical fruit. Durian, known affectionately as the King of Fruit is a popular fruit among Malaysians and those foreigners who have grown to love the fruit. Malaysian durian is different from other durian species available in the international market place. The fruit is smaller and more compact; it has an intense “fragrance” which may be too strong for the non initiated, but most wonderful for lovers of the fruit. The best durians are a connoisseur item; much cherished and savour by food gourmets. There are many varieties grown on the foothills of the Central Range that runs through Peninsular Malaysia. The most popular export specie is MaoSanWang (or Raja Kunyit in Malay) and D24. Seasoned Durian Lovers know that Black Thorn is the most premium durian fruit, but Black Thorn is very delicate to cultivate and the supply is extremely limited. 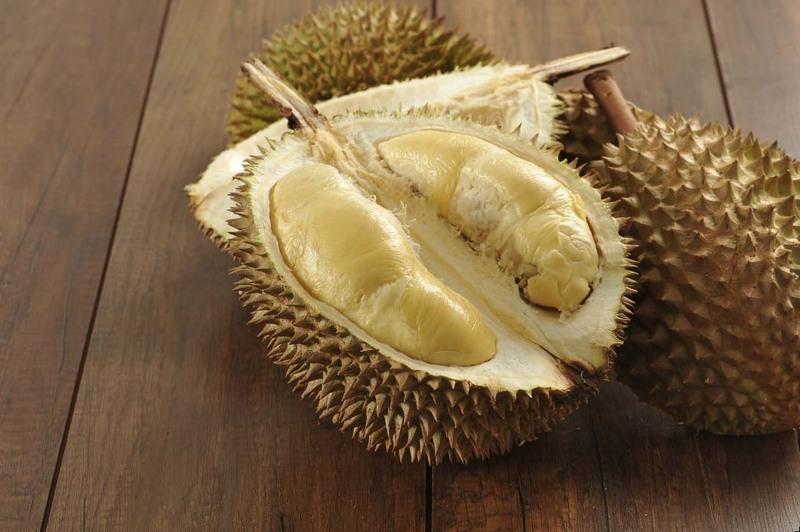 Malaysian durians are now available as fresh whole fruit outside Malaysia; the fruits ripe on the trees, and will fall naturally to the ground, usually at the end of the day or in the evenings. Orchard farmers went around and gather the fruit and take them to the market for sales. The whole fresh fruit cannot be kept without processing for more than 2 to 3 days; they are best consumed within 2 days after the fruit dropped. Because of this nature, whole fruit fresh durians cannot be exported in its natural form. These fruits are collected and are processed in quick freeze manner to keep the freshness. Processed at -30 degree Celsius, the goodness of the fruit is kept and preserved. It is said that good durians are like fine wine or good cheese. Durian “experts” will tell you, each tree bears a different fruit, the good durian has character and a distinctive taste of its own, whether they are sweet or bittersweet, you can tell the difference between good durians and the also-runs. There is no comparable fruit in the world. Durians are nature’s gift to Malaysians. Durian means “that thorny thing” in Malay. All across the Malay Archipelago in Asia, the durian reigns supreme as King of Fruits. Durian is an acquired taste; the durian is to Southeast Asia what foie gras, truffles and caviar are to the West. Western description of durian almost always contains words like “smelly”, “damp socks”, “odoriferous”, and other unpleasant adjectives to pin down what many in the Malay Archipelago would describe as fragrant aroma. Well, beauty lies in the eyes of the beholder, YES; it is AROMA to Southeast Asians. Many people come to Malaysia to join Malaysians during the durian festivals to eat fresh durians, direct from the fruit, as soon as it is opened. That’s when the aroma is freshest. Durian flesh has a soft texture; most have a fluffy soft smooth texture and taste. The best “tree ripe” durians are soft. The taste of durians ranges from sweet to bitter, the “bitter” taste in Durian is special; it gives a nice lingering after taste. Some durian flesh are drier, others creamy, like ice cream or chocolate. Good durians usually have a substantial amount of flesh, or body, between the skin and the seed. The flesh could be separated from the seed by the inner skin which itself is as tasty as the flesh. Durian is truly can’t judge its content by its thorny outside appearance. Some durian fruit may look irregular and has many thorns, but the flesh inside is most outstanding, and they command a high price. The colour of the flesh varies; most good varieties are golden yellow in colour, but there are many fruits which are white creamy, and taste just as heavenly. Photo credit to Asian Explorers Penang Durian.